Winter is, of course, cold season and it can be hard to avoid catching a virus during those few months. Should pregnant women be especially worried about common winter viruses? Could a cold or flu cause harm to a baby or trigger a miscarriage? Find out more below. Although cold and flu viruses can certainly make you uncomfortable (especially if you're pregnant and certain medications are off-limits), they aren't likely to cause miscarriage. While the CDC and other organizations claim that influenza may raise the risk of miscarriage, no conclusive studies have shown a link—at least in recent years. During the 1918 flu pandemic that spanned the globe, the influenza virus clearly played a role in miscarriages. It's thought that one in 10 pregnant women had early miscarriages during that time, over and above what would be considered the expected incidence. Since that time, though, studies evaluating the flu in pregnant women have not found an increased risk of miscarriage. However, having a fever during pregnancy (a temperature that's higher than 100 degrees Fahrenheit) is linked with an increased miscarriage risk. If you do catch the flu, your doctor may advise you to keep your fever well controlled with Tylenol (acetaminophen) while you are sick. Remember: Always ask your doctor before taking any over-the-counter pill while you're pregnant because many—like Sudafed (pseudoephedrine), Dayquil (acetaminophen, dextromethorphan, phenylephrine), Aleve (naproxen), Advil (ibuprofen), Motrin (ibuprofen), Bayer (aspirin), and Excedrin (aspirin, paracetamol, caffeine)—are not considered safe. It's important to note that the flu does carry other concerns for pregnant women. During the 2009 H1N1 flu (swine flu) pandemic, for example, women who contracted the flu while pregnant had an increased risk of premature birth, infant death, and intensive care unit admissions. The flu vaccination has been studied extensively and does not appear to pose any risk with regard to miscarriage. Since experts predict that the U.S. is overdue for another pandemic such as the one seen in 1918, it's wise for pregnant women to stay up-to-date with flu vaccinations. A cold and the flu can cause similar symptoms, even though they're triggered by different viruses. Symptoms of both may include fever, fatigue, body aches, and dry cough. With a cold, a person is more likely to have rhinorrhea (a stuffy and runny nose). 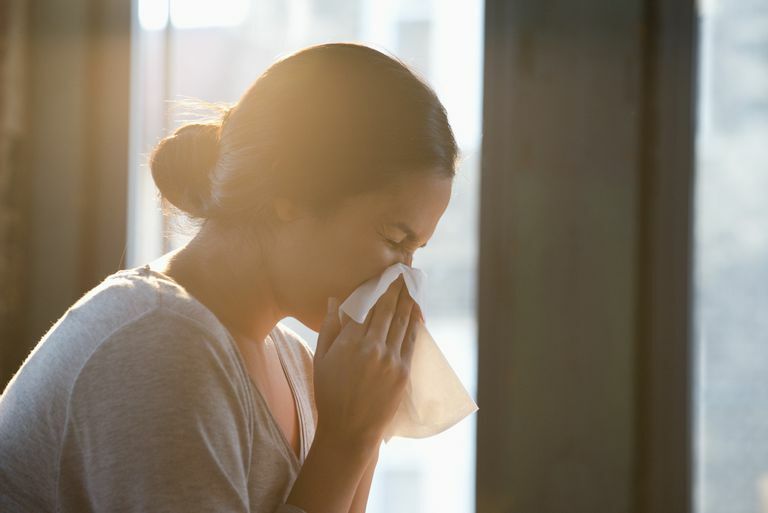 Furthermore, colds usually don't have the potential to lead to more serious problems that would result in hospitalization, such as pneumonia or more severe bacterial infections. With the flu, symptoms usually hit suddenly and they're typically more severe. Based on your symptoms alone, your physician may have trouble distinguishing cold from flu because they're both so similar. However, special tests can be done to distinguish between them. Fortunately, most people who get the flu recover after a few days. However, some people do develop pneumonia, a serious lung infection that can sometimes be deadly. Other respiratory infections can result from the flu, including bronchitis and sinusitis. The flu can also result in an ear infection (the middle ear is connected to the respiratory tract). The flu can also exacerbate other illness. For example, the flu can make asthma worse and serve as a trigger for asthma attacks. Additionally, the flu can make heart failure worse. There are some key steps that you can take to lower your risk of catching a cold or the flu. For instance, avoid close contact with people who are sick, wash your hands frequently, avoid touching your eyes, nose, and mouth, and disinfect things that you touch a lot (like your phone, your computer, doorknobs). Of course, general health habits like getting enough sleep, eating nutritious foods, being active, managing stress, and staying hydrated can all boost your immune system and help you fend off disease. Bloom-Feshbach, K., Simonsen, L., Viboud, C., Molbak, K., Miller, M., Gottfredsson, M., and V. Andreasen. Natality Decline and Miscarriages Associated with the1918 Influenza Pandemic: the Scandinavian and United States Experiences. Journal of Infectious Diseases. 2011. 204(8):1157-64. Doyle, T., Goodin, K., and J. Hamilton. Maternal and Neonatal Outcomes Among Pregnant Women with 2009 Pandemic Influenza A(H1N1) Illness in Florida, 2009-2010: A Population-Based Cohort Study. PLoS One. 2013. 8(10):e79040. Giakoumelou, S., Wheelhouse, N., Cuschieri, K., Entrican, G., Howie, S., and A. Horne. The Role of Infection in Miscarriage. Human Reproduction Update. 2016. 22(1):116-33. McMillan, M., Porritt, K., Kralik, D., Costi, L., and H. Marshall. Influenza Vaccination During Pregnancy: A Systematic Review of Fetal Death, Spontaneous Abortion, and Congenital Malformation Safety Outcomes. Vaccine. 2015. 33(18):210817. Tolandi, T. Patient education: Miscarriage (Beyond the Basics). UpToDate.